The Hull Music Hub is based at the Albemarle Music Centre on Ferensway in the centre of Hull. From this base the City of Hull Music Service provides peripatetic teaching to the primary and secondary schools, academies and sixth form colleges in the Hull area. The City of Hull Music Service works with children from year 4 upwards – currently every child in year 4 has an hour a week (the equal opportunities scheme) to try their hand at playing an instrument and singing. Those that enjoy this and discover a talent they didn’t know they had then have the opportunity to take lessons at very reasonable prices – the loan of a basic instrument is always free. There are termly concerts for all the ensembles at the Albemarle Music Centre and the senior bands, Orchestra and Choir get to perform for friends and family at the City Hall end of term concerts. The musical standards achieved are excellent – not for nothing is the City of Hull Music Service rated one of the best in the country. "The City of Hull Young Musicians’ Friends’ Association take pictures of these performances and use Repeat Signage to display these on a 60 inch screen at the Albemarle Music Centre". The centre itself provides a 250 seat concert hall, a rehearsal room, music library, instrument stores and many smaller rooms for teaching, small ensemble, meeting, examination and other uses. During the day, at weekends and during school holidays the facilities can be hired for meetings, conferences, concerts and anything else you can think of. Every evening during the week there are rehearsals for the seventeen ensembles – wind, brass and jazz bands, percussion, strings, choirs and orchestra. As we get more proficient with the software we hope to make use of the scheduling features to display content appropriate to the occupancy at the time. We have now found a member of staff that can access the system during the day and do regular event updates – essential with any system of this kind as displaying out of date information does not impress anyone checking for the latest events. "The City of Hull Young Musicians’ Friends’ Association are indebted to Repeat Software for helping to get this excellent tool up and running". 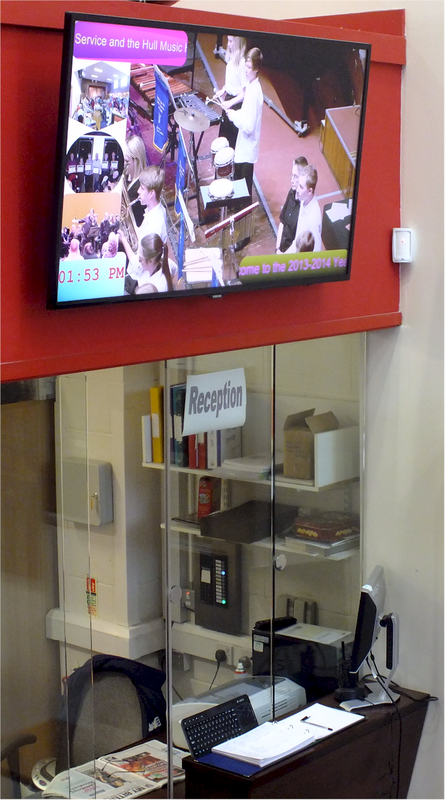 Repeat Signage digital signage software helps you get your message across and promote your products, services or events. It is easy to use and you can create a presentation and have it playing in minutes. All you need is a Windows computer, a display screen (or video wall) and Repeat Signage digital signage software. The software is economical to run as it is a one-time licence fee per computer playing presentations onto a screen (or 4 screens for the Media Wall edition), with free access to remotely update your content over the Internet.